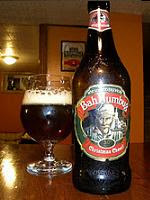 "Bah Humbug is a 5% abv brew using not just the traditional malted barley and hops, but also a big sprinkling of cinnamon. The effect of the cinnamon is to give a spicy, almost banana-like flavour as often found on German wheat beers; and this blends with the sweet-honeyed flavours of the Maris Otter barley to create a beer with all the fruit flavours of mince pies, Christmas Pudding and Christmas cake all rolled into one." This ale pours a deep dark copper colour. It has a two finger white head with decent lacing left behind. The aroma is very heavy on the spices. Clove ,cinnamon and malt are very prominent. There is also a hint of yeast and dark fruit. The taste is heavy on clove and cinnamon. There is a nice sweet malty body, some dark fruit with more clove to finish. It has a thin to medium mouth feel. My overall impression of this beer is good. It is a solid beer with all the spices for the season however the clove started to get to me after half pint. If the clove was subdued a bit it would have been more enjoyable. I would rate this beer a 7.5 out of 10.